After a day of playing in the spring mud, this knit bath puff is perfect for a hot bath or soapy shower. It knits up quick enough to give as a sweet mother's day gift, or to tuck into a spring holiday basket with a little bottle of shower gel. 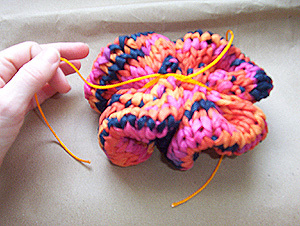 If you substitute yarn, test a swatch to ensure colorfastness in hot, soapy water. And make sure it is a quick-drying material like nylon. Using a long tail CO and leaving a tail of 2 yds, CO 30 sts. Work even in St st until 1 yd of yarn remains. Turn the rectangle into a tube by rolling the bound-off edge to meet the cast-on edge and stitching these edges together using the CO tail. Secure with two tight knots and trim any excess. Note: tight knots are important, due to the scrubbing action the Bonbon will be subjected to. 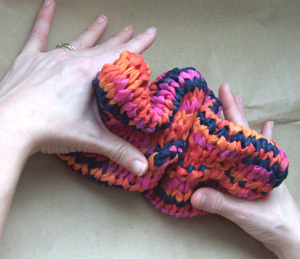 Follow the constrictor knot with two or three regular overhand knots to seal it. If desired, make a loop from one string end, and tie it down. I used a double-tied bow for mine. Cut off ends, and using a match lightly singe the ends of the nylon cord to keep them from fraying. Knot graphic from www.fishsa.com, South Australia's Ultimate Fishing Resource Guide. 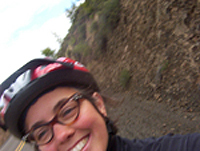 Larissa Brown is a mixed media sculptor and knitter from Portland, Oregon, whose work can be seen at www.larissabrown.net. Her knit sculpture was most recently shown at Gallery 114 in Portland. Her favorite knitting books are all wrinkly from being read in the bath. Pattern & images © 2004 Larissa Brown. Contact Larissa.